I was very pleased with the Duvet cover. Was everything I expected. Satisfy your senses as you snuggle up in our elegant Pure Melody Reversible Duvet Cover Set. The beautiful paisley details combined with our soft double brushed fabric will bring your bedroom decor to perfect harmony. Complete the collection with the matching sheet, quilt, and comforter sets available in the same Pure Melody design. 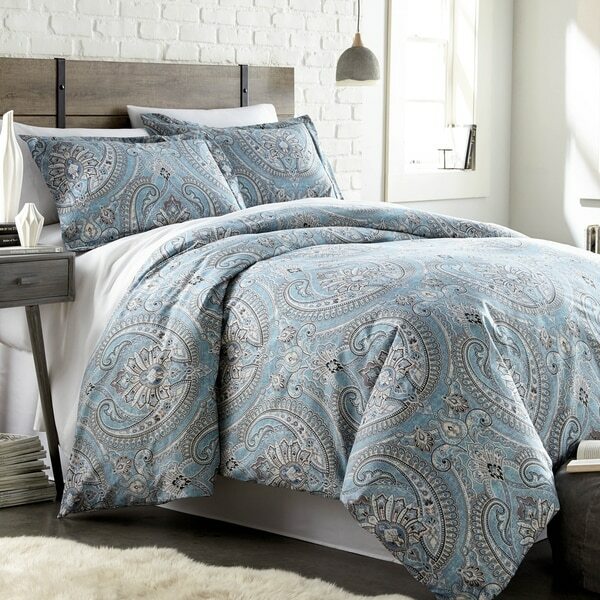 This is a beautiful duvet cover and shams set. It's very soft (microfiber) and came out of the drier virtually wrinkle free. I consider it a terrific value for the price - it's very well made and has a neat zipper closing at the end. Would definitely shop on this site again. Extremely satisfied with this duvet set. Gorgeous pattern, best quality you can ask for. This is the best microfiber quality I have seen. Does not wrinkles, very soft , looks amazing. I would highly recommend this product and shop for more items from this brand. I like this duvet and shams BUT it does not fit our CA King comforter. I can use it with adjustments and the colors are great but too short. This is a beautiful duvet. I ordered the queen and had is altered to fit my insert better. Love the corner ties and zipper. Washes well. This is such a pretty duvet cover with ties making it easy to stay put. Zipper closure which I love versus buttons and Supersoft eye-catching duvet! We absolutely love how soft this cover is and have very much enjoyed it. We haven't had it long enough to comment on how it lasts, but we certainly love how soft it is. Very nice duvet cover-soft and not heavy.Wish the colors were brighter,but still very pretty. I really like this. Colors are beautiful, very soft and the zipper makes it easy to put on along with the corner ties. My husband and I love this duvet cover. My husband says he likes the way it feels and how soft it is. Just as pictured, no bright surprises. Not difficult to put comforter inside. Shams are snug on pillows, so no 'flow', but could use smaller pillows. Adds little extra warmth. Very soft & comfy. Very soft and comfy! Small complaint is that the pattern is off centered slightly. Beautiful, soft, great quality, subtle color which contrasts well with bedroom furniture. Just as pictured. Nice looking and comfortable for a great price! The pattern is pretty and I found that brown sheets with this really look very nice w my neutral headboard. "How is the thickness of the microfiber? Can you see through it if you had an insert that wasn’t white?" It is 110 gsm. You will not be able to see the white insert through the duvet fabric. "Does the duvet have ties to prevent the insert from shifting?" I love the pattern, oriental and relaxing. love the quality of microfaser. Beautiful duvet for a great price.